Kicking Bones is a most subtle recording. Three musicians that know exactly where the edge is and traverse it's dangers. Their sounds slip and begin to plummet, yet these talented super powers reshape sonic fibers in form of a billowy parachute. What once was an armament of aural free form assault, now glides the skies in search of a grassy touchdown. 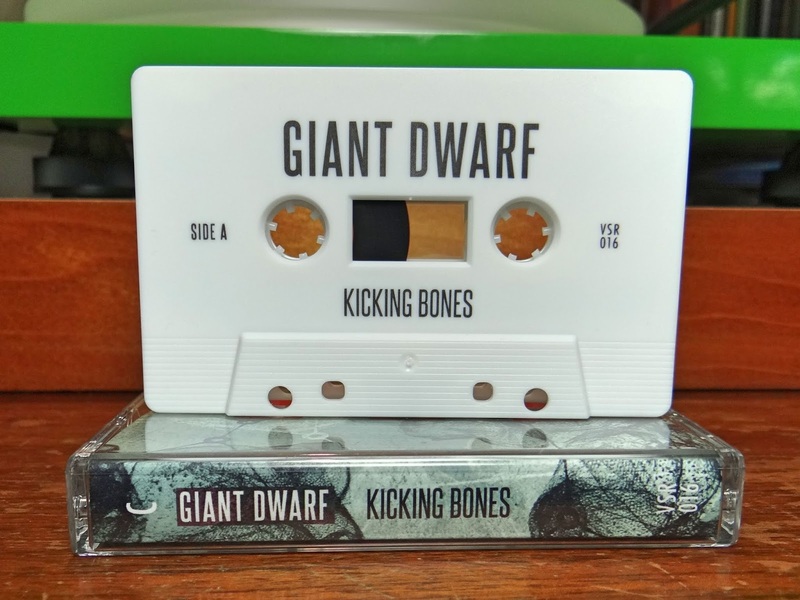 Giant Dwarf and oxymoron both in band name and in these musical sketches on Kicking Bones. Controlled mayhem, deafening silence, or polyrhythmic ambiance, there are both sounds to shelter from and more for full exposure. Trombone, guitar and drums, the set up for the base of ska. After repeated listens, the ska lites are turned off for certain. Kicking Bones is an amorphous memory of live music played during some feverish evening. It could have been jazz, classical, industrial or even precious ska, now just sonic stains oozing saturated decibel remains. 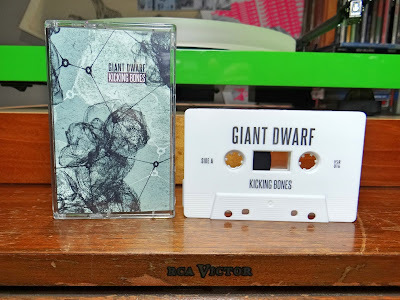 Giant Dwarf brought to mind an album on Nonesuch Records titled American Brass Music. This record featured The American Brass Quintet and compositions by fellow New York City residents, Charles Ives, Henry Brant and others. Added a couple links for sound samples, what could be found. This kind of comparison says a good deal about Giant Dwarf. Modernism stretching over one hundred years into the twenty first century. Sounds that challenge consciousnesses and placate those who can hear through the thresholds. Kicking Bones is a subdued beauty lasting the lengths of time. Brought to our attention by Very Special Recordings, the New York label harvesting sounds like swiftlet nests. Released a few weeks ago in July. Not sure what the total run is, but they are currently available. With so much diversity in sounds, many being extremely difficult to describe, the solace within the Constellation Tatsu Spring Batch is a needed retreat. For this quarter of the Spring Batch, Alex Crispin returns to Lost in a Sea of Sound, days before the completion of one Earth orbit around the sun. The first release was on the label Sounds Of The Dawn and was titled Idle Worship. 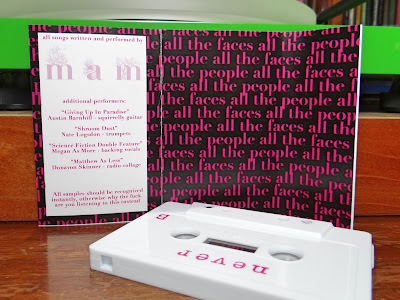 Amazingly there are a few copies of this cassette still available. 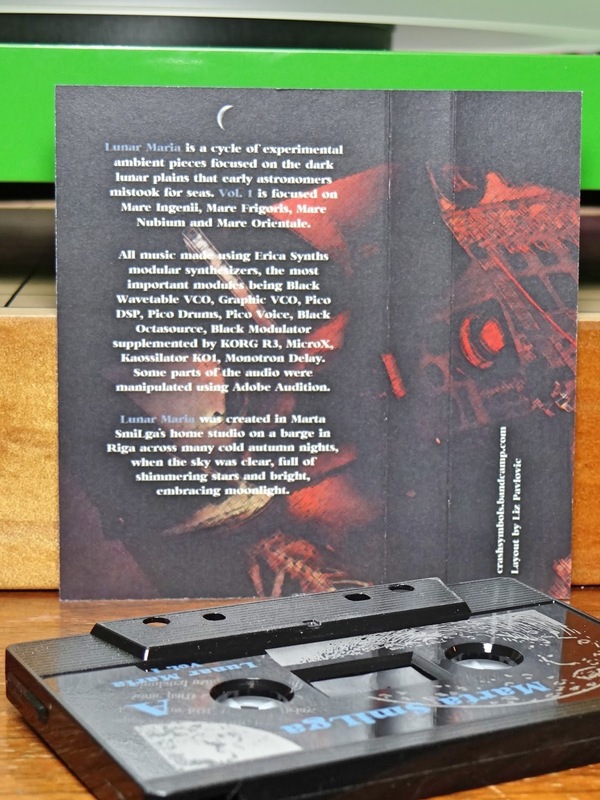 But a difficult choice indeed, the newest cassette titled Open Submission is another stunning ambient landscape. Open Submission breathes out just after the sun slips beneath the horizon. Shades and shadows emerging from the dazzling Idle Worship composition. These tones reveal themselves like fireflies on a summer evening. A few notes held in patience, swelling to countless connections covering the forest floor. Brief moments that should be revered, since twilight activities dispense into both darkness and sleep. Open Submission is divided into six track just under half an hour. Alex fills this time with excellent diversity, but like Idle Worship, embodies the entire composition with a congruent sonic hue. Energy drained from the course of a day replaced by emanate liveliness of the dusk. Perched on the edge of dreams, sounds encouraging conscious cogitation and simultaneously tranquilizing the physical form. Shaded aural fields lasting a few twenty fourths of the day. Time needed to mitigate both lengthy days and nights. Open Submission is a delight and has many listens ready for future moments. As noted from the start, this Alex Crispin composition is released on the Constellation Tatsu label as one fourth of the Spring Batch. 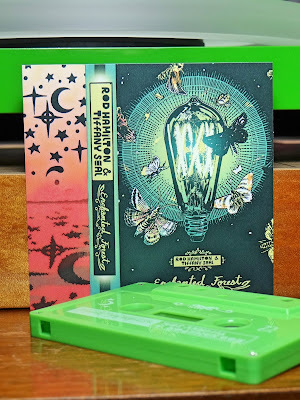 Both single copies as well as the entire batch are still available from the label. Had a note from the label the Summer Batch is getting close too. Turn the radio dial and hear the static of straining waves trying to obtain clarity. Fuzzy sounds from unknown distances are the most interesting, but they wax and wane, capturing then fading away at peak moments. Matthew As More has worked through the mathematics and fabricated the mechanism to negate attenuation. These distant languished melodies now clear, a sagacious world of sound finding focus. Apocalypse Never is another incredibly well done composition doing it's best to escape classification. Matthew As More manipulates time and genres, delivering a most subtle creation. Sixties rock and roll, modern pop, distorted funk transforming into deteriorating punk, Apocalypse Never is filled with a profusion of sounds. 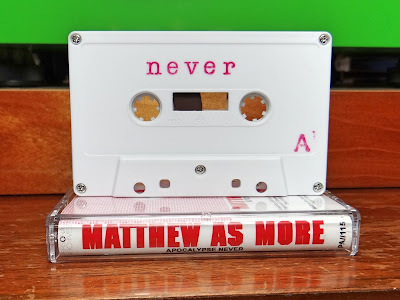 The longest track, "Matthew As Less", which kicks off the second side, is the most telling in respect to bringing distortion into substance. A radio dial being turned to eventual sonic delight. 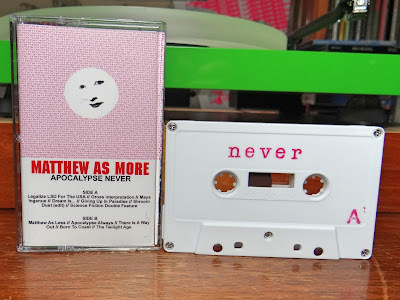 If the goal is trying to understand Matthew As More, this is an excellent eight minute sound shred that has it all. With twelve tracks making the bones of Apocalypse Never, the framework is incredibly solid. The number of catchy riffs and sticky vocals is more than can be processed on just one listen. Apocalypse Never is a tape for many repeated listens and this is a guaranteed fact by Lost in a Sea of Sound. If you just want to hear how talented Matthew As More is, based on a more traditional song structure, check out the track "Born To Coast". This track has cycled as a favorite in many listens. When opening the bandcamp page, the default track is "Dream Is", an understandable choice, but difficult to select. 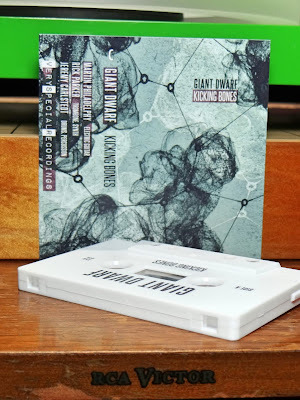 The ballad like "Science Fiction Double Feature", excellent, as well as the honed "Maya Ingenue", could easily be the go to tracks when opening the bandcamp page. A lot of great music on Apocalypse Never is the take away. Released in March in an edition of fifty by the Iowa label Personal Archives. Not sure how many copies are left, but they are currently available. Personal Archives does have a good bundle deal going and this would be one to get for sure. 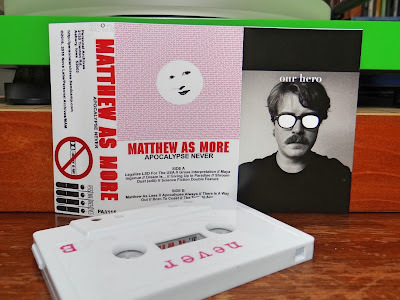 Would have never guessed this would be one of the best cassettes of the year so far. And it is! The energy of summer is at a peak. Heated days causing fauna to take solace in dark hues of stalwart fauna. This cycle producing a vibrant chorus of sounds at both dawn and dusk. A time when the natural world harmonizes for all to hear. This is a specific beauty, changing tunes throughout the world. 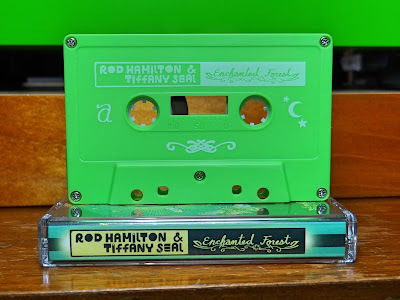 Rod Hamilton & Tiffany Seal have channeled into this aural field. Their composition Enchanted Forest, has an awakening vigor. Diversity throughout, but maintaining cohesive spiritual fabric. Enchanted Forest is extremely difficult music to classify. Many sonic approaches are used, including layered sonic rhythms, classic Indian flute wanderings, warbled drone, traditional beats behind voice and field recordings. These observations are based on many listens of Enchanted Forest. Fortunately the diversity and controlled margins make Rod and Tiffany's composition one to repeat. There are many comparisons that come to mind, but these brighten and dim with each track. One that holds consistency in tone and feel is music by Brian Eno and Jon Hassell. Their 1980 album was called Fourth World, Vol. 1: Possible Musics. Although the differences are understandably great, there are a few tracks on Enchanted Forest that kept bringing me back to Fourth World. Another interesting comparison, music and tone completely different, the track "Know You Birds" brought sonic images of "Weapon Training" by Throbbing Gristle from the 1979 cassette At Ajanta Cinema, Derby. Both tracks going through sounds made by animal and machine respectively. Rod and Tiffany are really out on their own path. Fortunately with the sound and feeling they embody, this is a beautiful trail to follow. 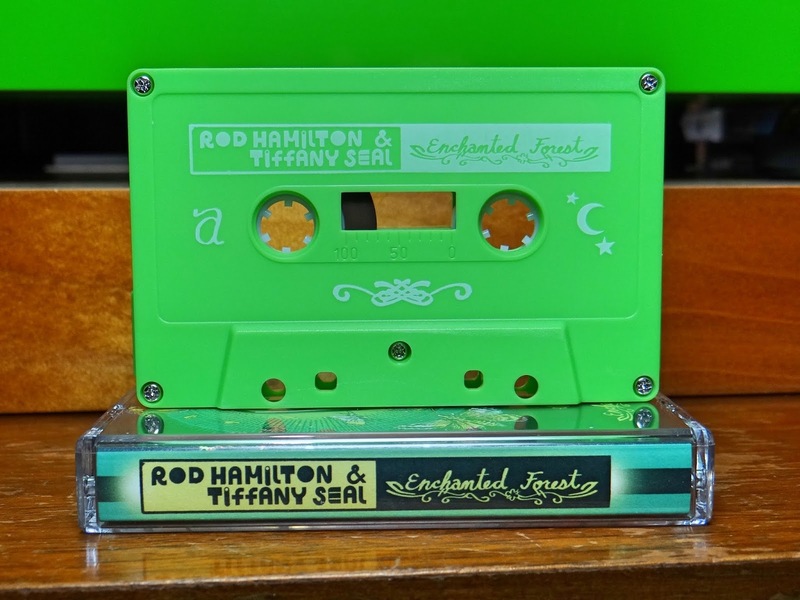 This cassette was released by Rod Hamilton & Tiffany Seal in late June. In an edition of two hundred, copies are available from their bandcamp page. 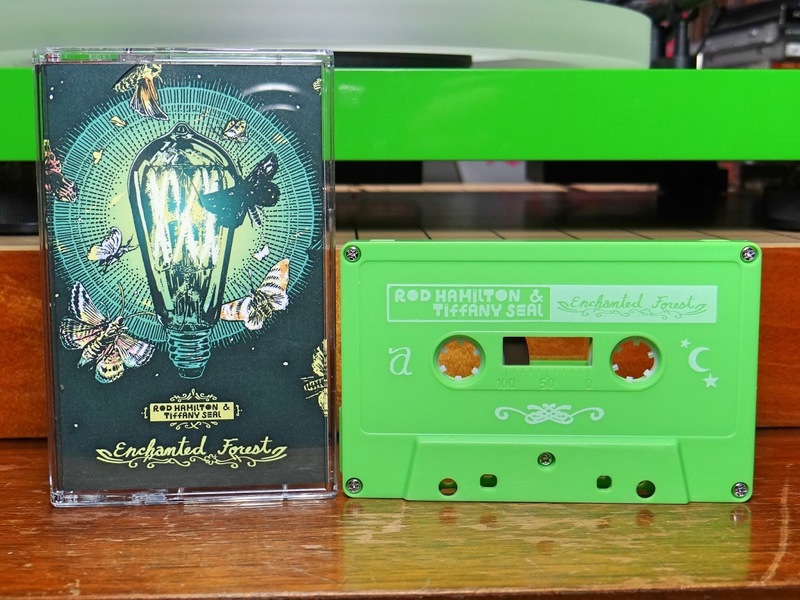 Enchanted Forest makes the second release described by Lost in a Sea of Sound for Rod Hamilton & Tiffany Seal. Previously worked on Versatile Ambience released on Ehse Records. Copies of this cassette are still available form the Ehse bandcamp page. Very Special Recordings delivers another genre smack down to the listening world. This time a cassette debut by Molly Tigre. Some descriptive words from the bandcamp page, "Polyrhythmic stew", "Ethiopian Funk" and "Progressive Jazz Cocktail". Without a proper listen, these categorizing labels are still very broad. Sample a track or two and the overall feeling will only mirror they way you feel when pressing play, the pitfall of sampling music online. How can the mood of an entire album be conveyed when the average time for skipping a song to the next is so high? Not going to go into this data set, but here is an interesting article if you are interested. 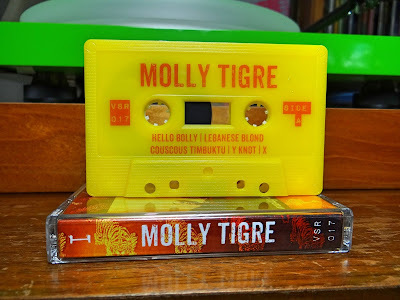 So let us dive into Molly Tigre and try to get the emotions these musicians are trying to bestow. First and foremost, each person playing music on this release, either in the band or as a guest, is extremely talented. Their love for music is derived from the music they love. With the base of the band being a quintet, the amount of influences is going to be high. 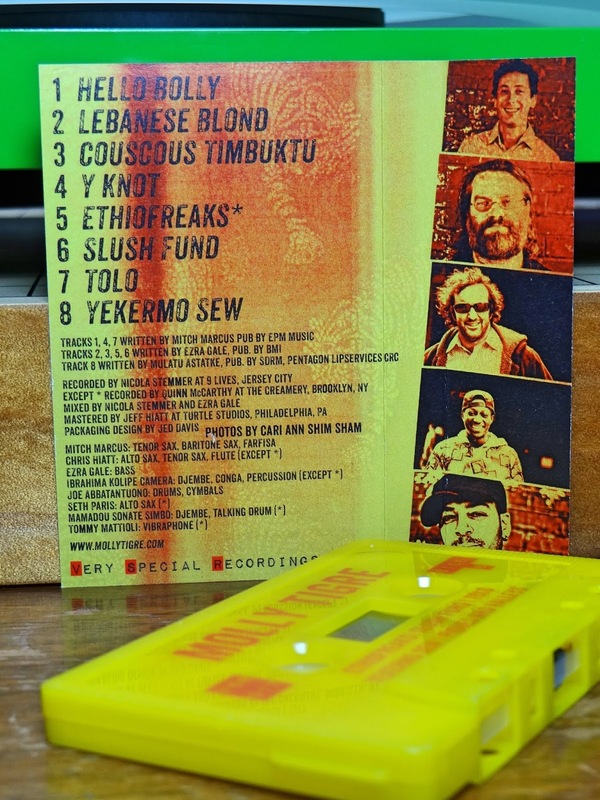 There is a very tight connection to the sounds of the recently passed Getatchew Mekurya, an astounding Ethiopian saxophonist. He developed horn sounds resembling Ethiopian war chants known as shellela. Powerful and haunting, the sax seems to focus in your consciousness, forcing you to take heed. Yes, Molly Tigre is commanding, rhythms imparting energy for a full hour or so. There is also both smoothness and playfulness. Like Ethiopian jazz master Mulatu Astatke mashed up with the chilled and tropical arrangements of Les Baxter. Resounding real jazz sophistication hanging like exotic arrangements from candle lit bamboo rafters. Or Brooklyn born Eddie "The Sheik" Kochak's rhythms backing New York's James Chance, super middle eastern influenced groove gone awry with punked out funk. 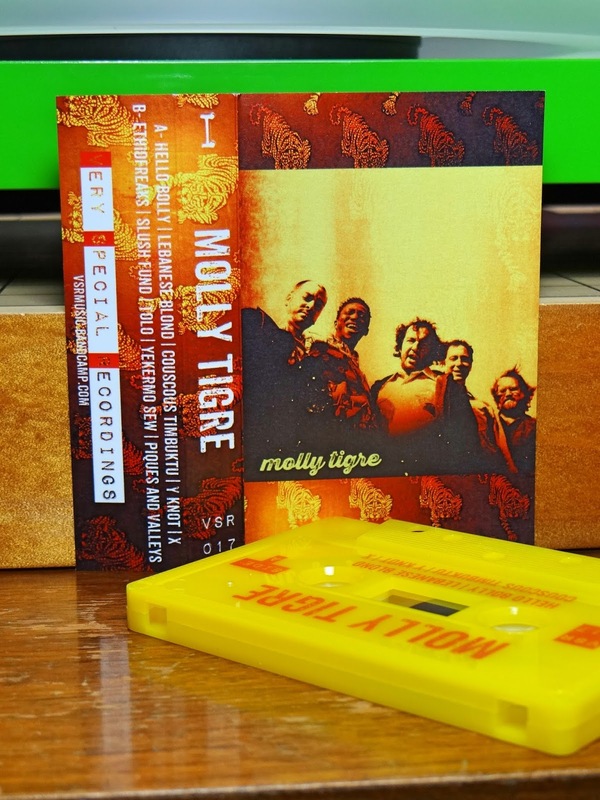 Molly Tigre takes listeners on a world tour, but maintains poise throughout the entire composition. The objective is never to show how much they know or how skilled they are, the solid rhythms of both base and percussion keep these songs too perfectly grounded for that. So, free form jazz, this is not. 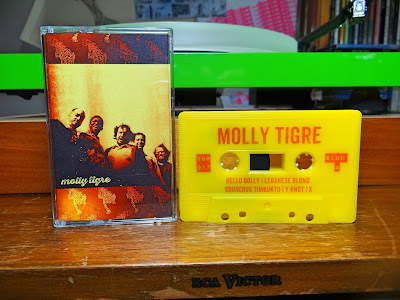 Molly Tigre is the cool fifties vinyl you luckily find in the thrift store. Five guys standing by the hotel pool in matching suits, holding instruments like armament, half smiles on their faces, saying yeah to time, you caught us working. After listening through this release multiple times, there are many feelings Molly Tigre imparts. Straight forward from start to finish but complex all the way trough, i guess this describes life itself. Released on Very Special Recordings in the middle of May. 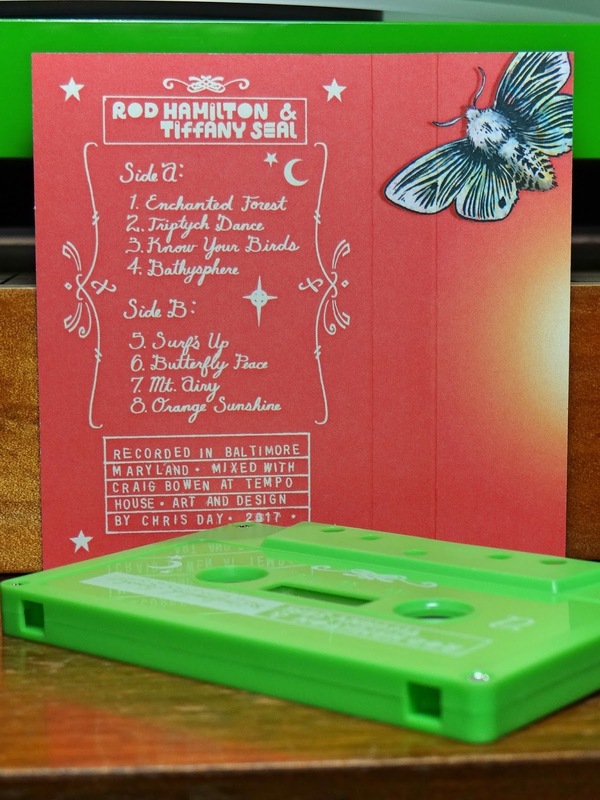 Not sure what the cassette run is, but tapes do have two extra songs not available on any digital platform. Thanks VSR, for making the physical purchase just a little bit more special. Notes stretched out to cross the horizon, their pure sounds enduring radiation and elements. Warbled tones arrive from unknown sources, sonic contours under duress. Marta SmiLga is situated by the edge of a cold sea, listening intently to a distant world. A consciousness absorbing an aural landscape, contemplating the world beyond the horizon. Imagination is cast a couple hundred thousand miles away to an orbiting sphere, dark seas splotched across it's exterior. The surface of the Earth and Moon are totally different, but there is a connection. Droning vessels are used to cross each void, the buzz and bleeps of life making the journey. 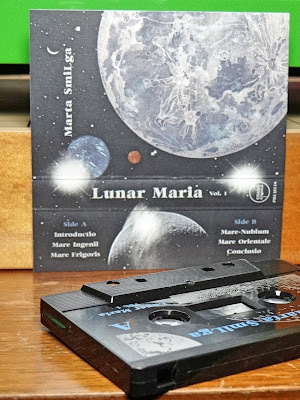 Lunar Maria, Vol. 1 is built around the theme of the moon and its vast craters. Early astronomers thought these impact zones were seas on the lunar surface. 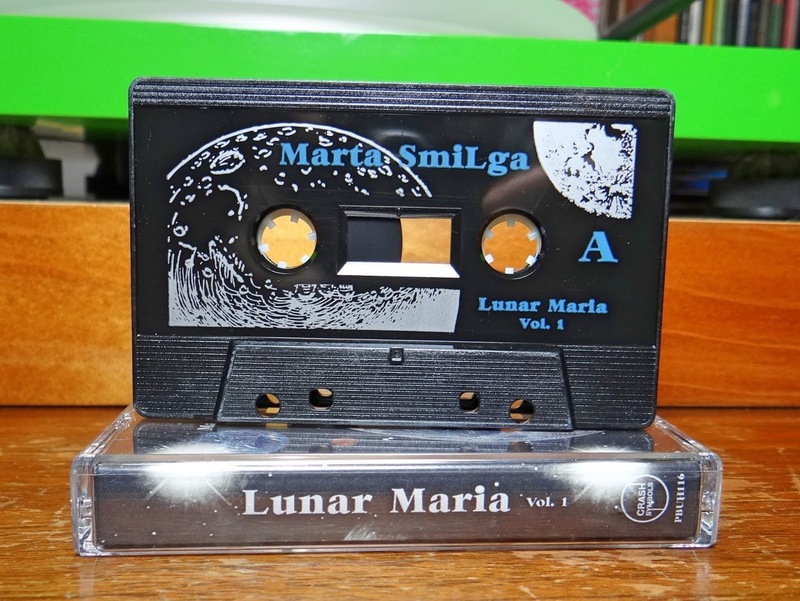 Marta SmiLga uses song titles reflecting actual craters on the moon, such as "Mare Nubium", "Mare Orientale" and "Mare Ingenii". Six tracks in all, with an introduction and conclusion. It is interesting how humans have established what can be classified as classic space sounds, since there is really no sound in space. Our ideas possibly based on early science fiction movies, sound effects from planetariums or even some inherited memories of the journey our possible ancestors made to arrive here. These connections can be their own lengthy discussion, the focus now is Lunar Maria, Vol. 1. A brilliant droning canvas with sonic brush strokes from a world most will never see. 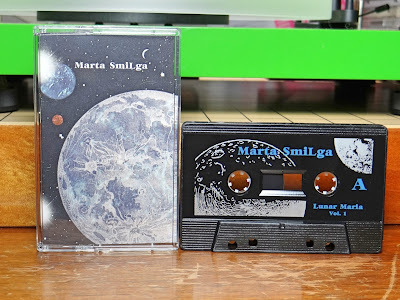 Marta SmiLga has composed extremely fluid and coherent atmospheric music for the atmosphereless emptiness. A sonic companion for dreams of travel to the moon and beyond. Beautiful with wandering tones of mystery, Lunar Maria, Vol. 1 is complex but never a difficult listen. The weightlessness keeps this heavy easy to digest. Released on Crash Symbols in April. When the process started for listening and writing descriptive words, there were five copies left. Now there are only two. If interested, get one of the last couple copies quickly, they will be gone. 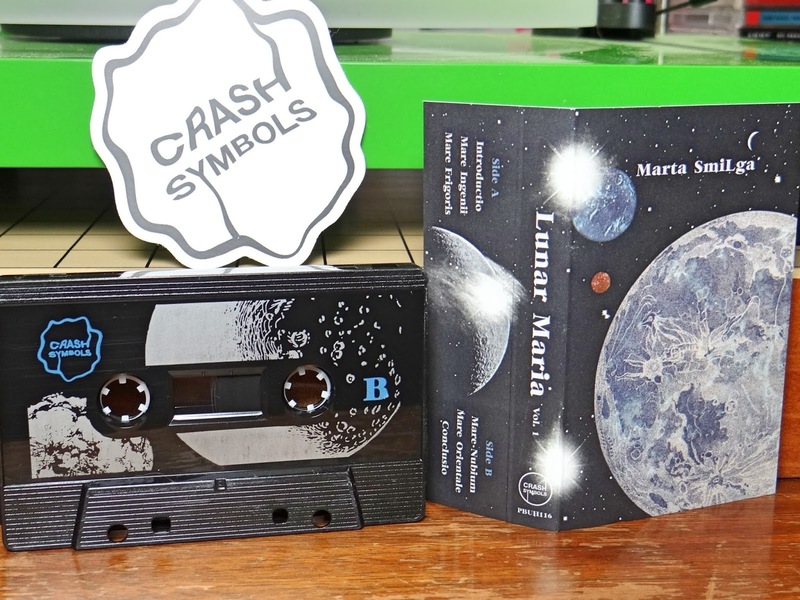 Crash Symbols sells out just about everything in short amounts of time. To begin this description of La Production Interdite, volume and quality of the playback sound system need to be addressed. Listening to this composition at lower decibels and through newer all in one powered speakers, produces a totally different experience. This is compared to a serviced cassette deck, delivering higher decibel sounds through real stereo components and quality speakers. There could be an argument for the beauty of duality, La Production Interdite having two deliverable aspects. With this potentially being true, the mood and feel of inferior playback is only a byproduct. Louder volume and components of caliber are the best starting point. There will be a very immediate realization that Thomas Bey William Bailey did not intend for La Production Interdite to be background ambiance. With the proper listening environment established, the most pressing issue will be the conscious state. Thomas Bey William Bailey uses sonic structure to permeate psychic barriers listeners have constructed. An aural fusillade with focus on the third eye, the physically demonstrated center point between both eyes, located above the bridge of the nose, on the lower part of the temple. Here, La Production Interdite applies pressure, like a wedge sending vibrations through the mental constitute. 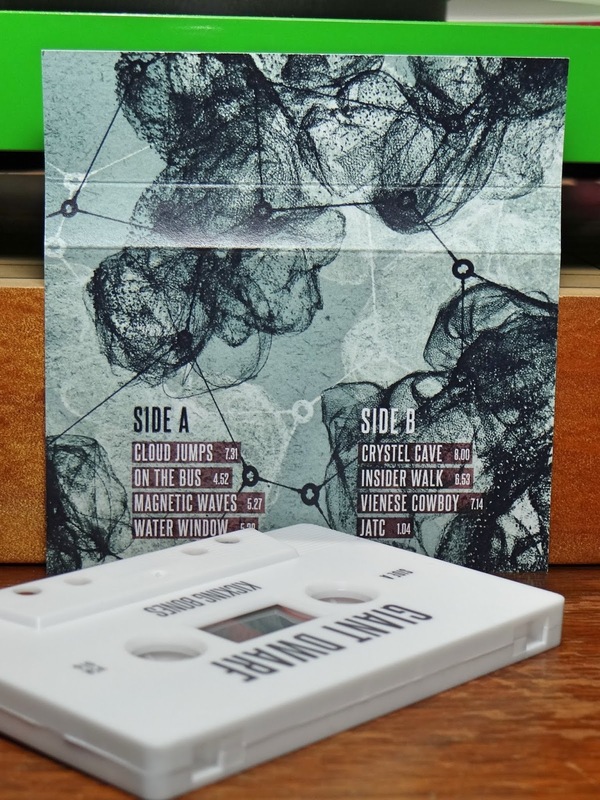 Dividing a world of overlaid drones by tearing and ripping the aural fields. Thoughts become unconnected as supplementary sounds arrive from a spectrum with unknown ends. The overall intensity augmented across the infinite lull. So much empty space, the most minimal sounds in limbo across a dazzling and tranquil field. Peaceful moments are continually interrupted by an immense force, underlying currents conducting cosmic radiance. This can be both beautiful and terrifying. Thomas Bey William Bailey has composed an empyrean world, the fabric of sound in constant flux, making difficult to describe the ebb and flow. Interludes of total sparseness, like an astronaut on a distant space walk, ultimately alone. Turning towards the sun, radiation fills the face shield, want for isolation again is the only thought. This rotation maintains it's azimuth as both feelings become welcomed and dreaded simultaneously. All of this on the first thirty minute side of La Production Interdite. The second side takes listeners through the inner workings of Thomas Bey William Bailey motivations. Like a director's cut, narration is combined with an echo of the first side. Astral projection, doppelgängers and how the conscious responds to sonic input are some of the topics breached. La Production Interdite is released on Elevator Bath from Austin Texas. The cassette made in a very limited run of only fifty. The description Elevator Bath has on their bandcamp page fits this Thomas Bey William Bailey composition so well, "Elegant abstract music: Highly developed, often atmospheric, subtly intense, always open to interpretation". 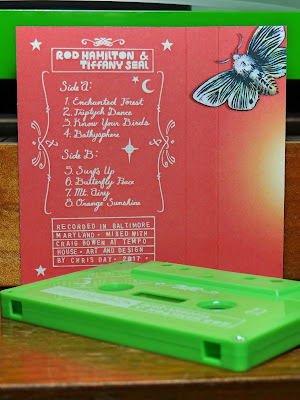 Another release from the label pondering the fringes and pulling on new beauty.